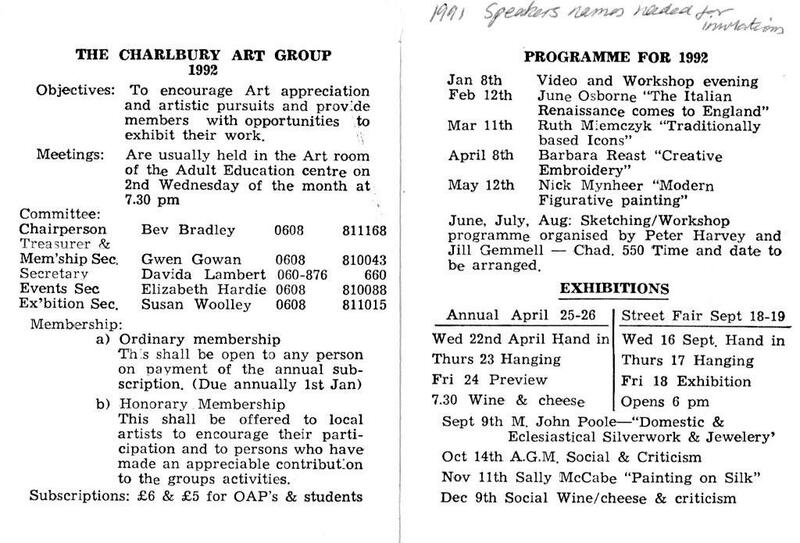 The Charlbury Art Group was started in December 1988 by John Patchett, a tutor at the Charlbury Adult Education Centre. 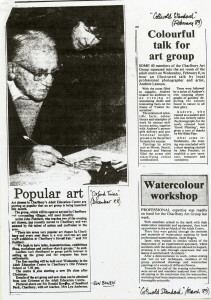 Although 4 art classes were held at the Centre, there was no Art Society in the immediate area. The first meeting was held on 11th January 1989 in the AEC and the first annual exhibition opened on June 24th 1989. Soon aftwrwards John Patchett left Charlbury to pursue his career elsewhere and the group was run by an acting committee. In 1991 a constitution was drawn up and the committee proceeded on a formal basis. 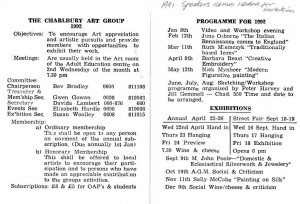 In 1996 the name was changed to Charlbury Art Society as it was felt that many people interested in art wanted to join but thought the group was only for painters. The Society has continued very successfully, meeting on the 2nd Wednesday of the month, September to June, with an outdoor sketching evening in July. Outings are arranged to major exhibitions. 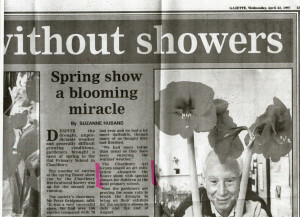 An annual Spring Exhibition is held in the Memorial Hall, and a Street Fair Exhibition September in the Corner House. Subjects for the meetings, currently held in the Garden Room of the Memorial Hall, have included illustrated talks and demonstrations of all forms of paintings, stone and wood carving, sculpture, printing, calligraphy, framing, art history, embroidery and needlework, ceramics and pottery, schools art, wildlife art and an annual critique of member’s work. New members are always welcome, and non-members may attend for a small fee. The current membership numbers around 65, from Charlbury and the surrounding area.